To call tonight’s line-up huge is probably the understatement of the year. 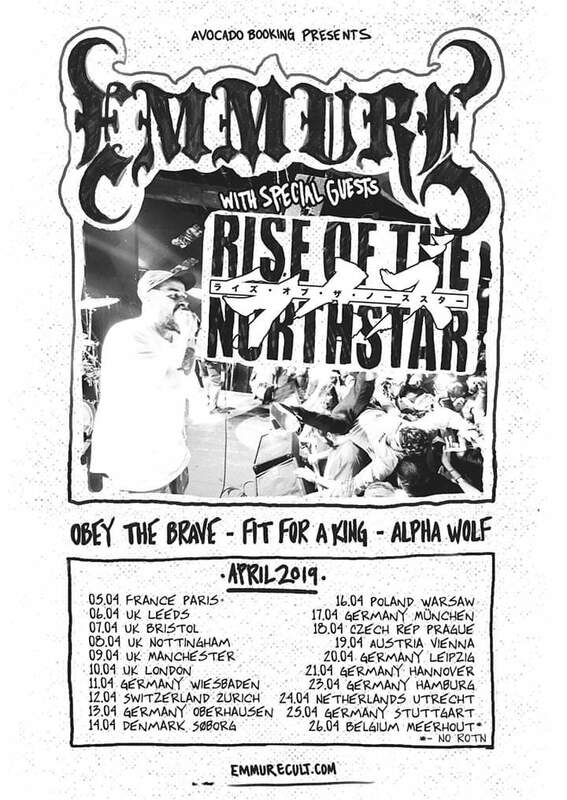 Headliners Emmure smashed up Camden Electric Ballroom headlining the Impericon Never Say Die Tour in 2017 and with “Look At Yourself” out now via SharpTone Records have released an album which surpasses their previous work. Thanks in part to re-tooling with a now seemingly former Glass Cloud trio in guitarist Josh Travis, bassist Phil Lockett and drummer Josh Miller. Melbourne Australia’s Alpha Wolf [9/10] have come a long way to be here on this tour. They are about to release new EP “Fault”, their first with new vocalist Lockie Keogh and with single “Sub-Zero”, they are about to usher in a new era for the band. They’re greeted by a filling venue but get a couple of row boats (fans sat in a line, rowing together) that burst into moshing. They’re way too far down the billing but will no doubt be much higher the next time around. They are simply phenomenal. Dallas Texas Metalcore crew Fit For A King [8/10] have embraced clean vocals with their current album “Dark Skies” but tonight they roll out their heaviest material in a bid to go toe to toe with some of the heavier acts. “The Price of Agony” is a stand out with the band in fine, high energy form with bassist Ryan O’Leary full of breakdown stomps and swinging his bass around like it’s confetti at a Wedding. Signed to Nuclear Blast Records, French natives Rise of the Northstar [7/10] have their work on “The Legacy of Shi” to thank for this billing. They’re a mix of a modern take on older crossover Thrash bands like Suicidal Tendencies with a hip-hop rap scream flow and Japanese culture influences. It’s an eclectic mix and while they have a “Black” era Metallica melody moment mid set and a powerhouse kit performance, some of the spoken or rapped lead vocals are drowned out. The main event Emmure [10/10] waste no time with a set loaded with tracks from “Look At Yourself”. From the very start, the audience are signing back the lyrics at Frankie Palmeri and he’s on point throughout. “4 Poisons 3 Words”, “Children of Cybertron” and “Solar Flare Homicide” are simply phenomenal played by the re-tooled line-up. The addition of a projector onto a white screen behind the band adds a certain something as video clips play during some of the songs, while at other times the lyrics appear. It’s been done before but the 50 minutes from the headliners on a 5 band bill is immense as they flood the arena with Deathcore grooves and pummellingly kit work. Live Review: SikTh w/Valis Ablaze & Exist Immortal @ Reading Sub89 21/02/2018! Live Review: SikTh, Loathe & MSRY @ The Bullingdon in Oxford!